It’s going to be a busy year this year – and a lot of fun if you like my books. So what do I have coming for you? I’m just putting the finishing touches to the first book in a new detective series. The protagonist – Holden Priest – draws upon all the best traditions of the genre. Imagine him as having the intellect of Sherlock Holmes and the personal problems of Gregory House and you’d be in the right vicinity. The new book has the working title of The House in the Woods and sees Priest tasked with the investigation of a mass killing at the same time as the trial of the main suspect. Part detective novel, part police procedural, part courtroom drama – I’m having a lot of fun with the book and have it slated for a March release. I’m also just finishing a stand-alone espionage thriller called The Vault. It’s set in East and West Berlin in 1989, just a few months before the fall of the Wall. I won’t say too much for fear of spoiling some surprises in the book, save to say that if you have enjoyed my Milton and Beatrix books then you’ll meet some familiar characters, but not necessarily in a setting that you’ll recognise. The novel has what I consider to be one of my best starting premises: after the Wall was built, many East Berliners were stuck on the wrong side and could not get back. These people often left belongings behind. The East German secret police – the Stasi – confiscated all of this loot. The novel sees a bank robber from Belfast sent into East Berlin where he is tempted by the Stasi gold that he thinks he might be able to get his hands on. This book will be premiered as an Audible Original. This means that a cast is being put together, including some well-known names, to deliver the story in the form of a radio play. The ebook and print editions will follow three months after the audiobook makes its debut. Of course, you wouldn’t expect me to forget about Milton and the Roses. You won’t be disappointed. This will be the busiest year yet for everyone’s favourite assassins. The next book that I move onto after finishing The House in the Woods will be a full-length novel set in Hong Kong featuring Beatrix. It’s set in the interregnum between her banishment from London at the beginning of the Milton book Ghosts and the end of that book where she is reunited with Isabella. Several years are covered in that period and I have plenty of ideas that will allow for several books to feature Beatrix and her continuing misadventures as she searches for her daughter. It’s also looking increasingly likely that there will be a Beatrix Rose TV show in the next couple of years (keep your fingers crossed) and that show will feature the Hong Kong years very heavily. I’m going to mine them for some gripping, exciting tales. The new book has the working title of The Return of the Dragon and sees Beatrix helping out a translator who has been working with her as she undertakes assignments on behalf of the powerful local triad boss who has taken her under his wing. If you’re interested in getting up to speed, I recommend you grab a copy of the Hong Kong Stories, Volume One. I’m planning the fifth Isabella book for the middle of 2019. I have some ideas as to what the book might include, especially now that I finished watching the excellent Killing Eve. More on that book later, but Isabella has unfinished business and she’s getting older…. And, of course, Milton will be back. 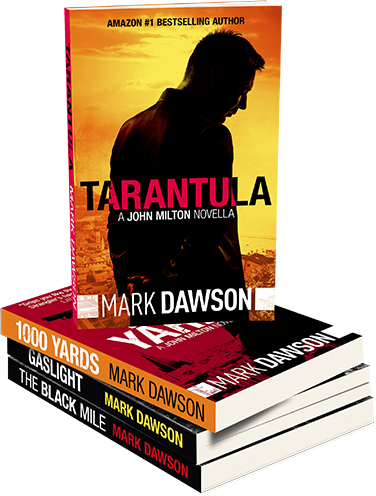 I’m planning for books this year that will see Milton visit Malaysia, Las Vegas, Bucharest and the Pyrenees. There’s also a good chance I might fit a fifth with Milton getting involved in the civil war in Yemen. I have a killer twist for that book that you won’t see coming. So, yes I’m going to be busy. But this isn’t work for me – giving you fun reading is something I love doing, and the prospect of a full slate – replete with big, juicy ideas – fills me with enthusiasm to get to my desk each morning. I hope you’re as excited as I am. To stay in touch with when these new books will be available – and to grab two free books – remember to sign up for the Reader Club. Just fill out the form on the front page.